The RSPCA is appealing for information after a cat was shot in the face at point blank range in Nottinghamshire and had to be put to sleep because of his appalling injuries. 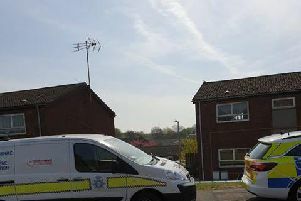 The horrific incident happened on Saturday morning (June 9) after the cat, called Fred, went outside as his owner Denise Thompson left her home in Slant Lane, Mansfield Woodhouse, at around 8.30am. When she returned home just before noon, her friendly feline was not around to greet her - as he usually would - so she went to look for him. She found him with blood pouring from his mouth in the back garden. She rushed Fred to the PDSA hospital in Nottingham for treatment and was unaware what had caused the injury. But an x-ray taken at the hospital revealed he had been shot at close range with an air gun. The injury was described by the vets as “the worst injury from an air gun we've ever seen”. Fred’s jaw was shattered on impact and the vet decided his injuries were so severe that he had to be put to sleep to end his suffering. Fred’s owner Denise, who welcomed the stray cat into her home five years ago, is too distraught to talk about the incident but her daughter Christie Conroy has made a plea to find the person responsible. Christie, who lives nearby in Sandringham Road, said: “When mum came home she couldn’t see Fred so she went in the garden where he has a little house that he can go in and she found him lying down with blood pouring from his mouth so she frantically took him to the PDSA hospital. “She had no idea what had happened until the vet took an x-ray which showed his jaw had been shattered by an airgun fired at close range and they removed the pellet. “Mum is devastated as Fred was good company for her, now she sees his belongings around the house and gets upset. “I think it’s particularly hard for her to deal with the way he died. If it was natural causes, or even an accident, then she could probably accept it more but because someone has deliberately hurt him in such a horrible way makes it much more difficult for her. RSPCA inspector Keith Ellis, who is investigating the incident, said: “The incident has obviously left Fred’s owner distraught. She took Fred in as a stray who ended up on her doorstep, she had him neutered and offered him a loving home and then this happens. “We are not sure if Fred was shot near the house and he managed to make his way back into his garden or if someone came into the garden to shoot him - but we believe someone must know who is responsible and I would urge them to get in contact if they have any information. Last year, the RSPCA received hundreds of calls to the 24-hour cruelty hotline reporting airgun attacks. Inspector Ellis added: “Cats and wildlife are normally the animals that are more susceptible to these incidents simply because they are out in the open with no one to protect them. Unfortunately, air rifle attacks are not as rare as we would like and the injuries caused by such attacks are horrific and often fatal. "We are supporting Cat’s Protection’s call for tighter controls on air weapons. This, along with better education and explanation of the law when buying an air gun could help relieve the problem. “These weapons cause horrific pain and suffering and it is illegal. Anyone caught deliberately using an air gun to injure an animal can be up to six months in prison and/or an unlimited fine if found guilty under the Animal Welfare Act." If you have any information contact the RSPCA appeal line on 0300 123 8018.